The Madhya Pradesh government is all set to evict around 15,000 families by July-end in the Narmada Valley, even as Gujarat government is readying itself to close down the 30-odd gates on the Narmada dam in order to take the water level in the dam’s reservoir from the present 121.92 metres to 138.64 metres. Quoting official figures, top anti-dam activist Medha Patkar has said, 8,200 families to be evicted will be from Badwani district and 6,132 families from district Dhar, apart from a few families from Khargone district. Yet, she says, “The police and revenue officials are visiting one village after another with drone cameras to photograph long distance visuals of the areas to be vacated. 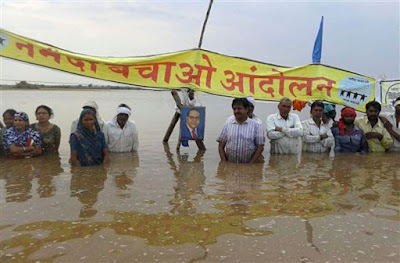 To give expression to this wrath, Patkar says, her organization, Narmada Bachao Andolan (NBA) has decided to hold a three-day "Save Narmada, Save Life" yatra, starting at Indore, Madhya Pradesh, on June 5, and ending at Vadodara, Gujarat, on June 7. The aim of the yatra, according to her, would d be to campaign against the effort to close the Narmada dam’s 30 odd gates to store water up to the full reservoir level – 138.64 metres from the present 121.92 metres. Wondering why are Madhya Pradesh and Maharashtra supporting this “devastation” caused the Narmada dam in the downstream, Patkar says, neither of the two states are to get even drop of water, and the only beneficiaries would be “the rich corporates and big urban centres” of Gujarat. Isn't this the same lady who got thrashed in the recent elections? So much for the "voice of people". It's so funny that it's tragic.